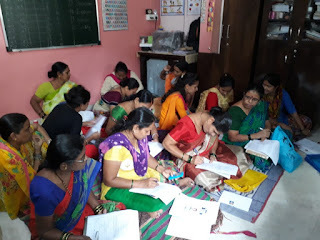 17-July- 2018, Pune: The Don Bosco Development Society (DBDS), Pune organized a Health and Nutrition Awareness session for women in Jai Jawan Nagar slum in Pune. 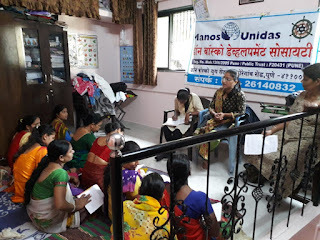 19 women participated in this event held under the aegis of ‘Women Empowerment Project’ supported by Manos Unidas, Spain. Mr. Jyoti Sonwane (Staff-DBDS) welcomed to the participants and informed them about the activities of Don Bosco Development Society and Manos Unidas project. 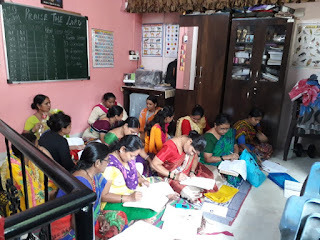 Ms.Nilima Chandhare (Trainer-DBDS) was the resource person. She explained the relationship between health, food and nutrition. She paid special emphasis on the household cooking process and items used in cooking. She also gave information on Mahatma Phule Jivan Arogya Yojana. She then gave information on the daily nutritional requirement of pregnant women. Program ended with the vote of thanks by Ms. Jyoti.